For centuries, Christians have turned to the Benedictine practice of lectio divina, or sacred reading, to pray the Scripture and deepen their experience of God’s presence in their lives. In this gentle book, Mary Earle, who has suffered with serious illness of her own, explores how this ancient practice can be used to “read the text of our illnesses,” and, in doing so, discover God’s presence and guidance even in the midst of pain and suffering. “Writing with authenticity of one who has “been there,” Mary Earle offers compassionate and practical guidance to those suffering from serious, chronic, and terminal illness. 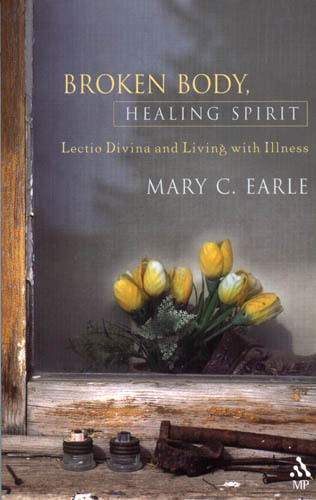 Her adaptation of the ancient Benedictine practice of lectio divina is creative and inviting: Through carefully structured exercises the sufferer is let to “read” not only Scripture but the body and the illness prayerfully. The tone of the book is warm and supportive, always aware of the physical and emotional limitations of the reader. Although it is intended primarily for the person living with illness, Broken Body, Healing Spirit is also a valuable resource for anyone ministering to the sick.” – Margaret Guenther, author, Holy Listening: The Art of Spiritual Direction. Mary C. Earle is an Episcopal priest, poet, author, spiritual director and retreat leader. Until her retirement, she taught classes in spirituality for the Seminary of the Southwest in Austin, Texas. Mary has authored nine books; the subjects include the spirituality of living with illness, rule of life, Celtic Christian spirituality, the Desert Mothers, and Julian of Norwich. Mary has offered presentations and retreats in a variety of ecumenical settings, including conferences of the Academy for Spiritual Formation, Spiritual Directors International, the International Thomas Merton Society and hospice organizations. She has written articles for a variety of journals, including Presence: the Journal of Spiritual Directors International, Radical Grace, Reflections, and The Lutheran. She was included in the Living Spiritual Teachers project of Spirituality and Practice. SKU: 978-0-8192-1928-2. Categories: Books, Mary C. Earle. Tags: Lectio Divina, Mary C. Earle.